Opting not to go by plane means to actively protect the climate. Avoid flights when there are means of transport that are more environmentally friendly. It's especially short-haul flights that strain the environment disproportionately, as set-off and landing are the stages where additional energy is used. Other means of transport are more climate-friendly and provide the possibility to observe the landscape around you. By making a stopover on your way, the journey itself may become a vacation. Try to fly less frequently and stay in one place for a longer time. This will also benefit the local population because you make use of more services. Rule of thumb: for a flight of up to 2,000 km distance you should stay at the destination for at least 8 days, for a flight of more than 2,000 km distance you should stay at least 14 days. Voluntary climate levy – good to know about! The emissions calculator uses the Radiative Forcing Index (RFI), a factor that takes into consideration the increased greenhouse effect of pollutants in higher altitudes. An RFI of at least 2.7 is adequate. 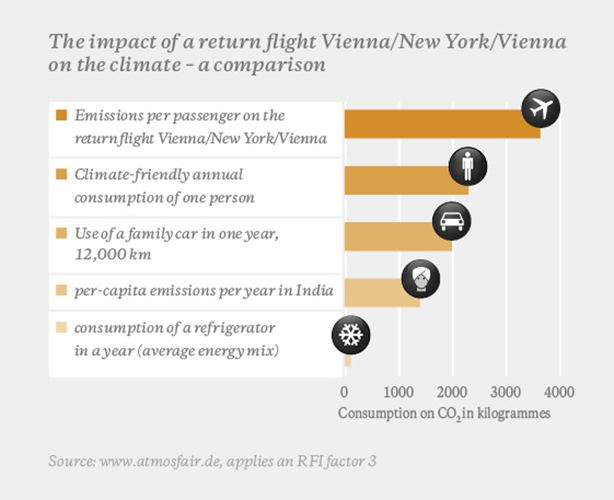 A serious provider ought to point out that refraining from a flight is best to save the climate and recommend that especially short-distance flights (up to about 1,000 km) should be replaced by more environmentally friendly means of transport such as train or bus. Paying a climate levy is not a legitimation to not change the way of travelling and thus continue to pollute the environment.